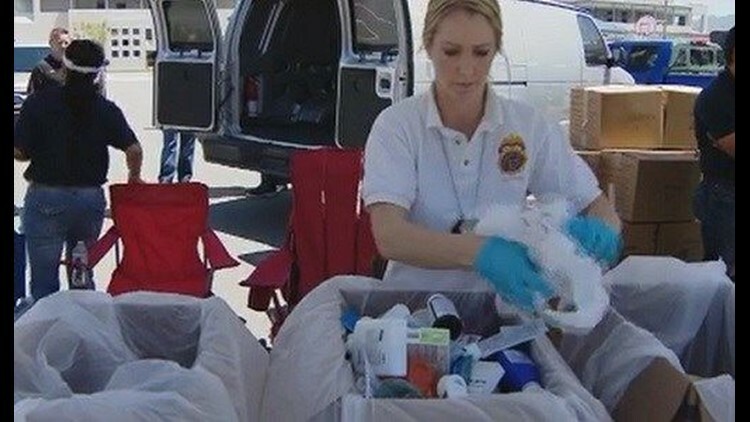 San Diegans will have a chance to dispose of unused or unwanted medicine at dozens of sites around the county Saturday as part of National Prescription Drug Take Back Day. SAN DIEGO (CNS) - The San Diego police and sheriff's stations will be among the collection sites where local residents can drop off expired, unused or unwanted prescription drugs today during National Drug Take-Back Day. The effort, organized by the U.S. Drug Enforcement Administration and local law enforcement agencies, is intended to highlight the importance of taking commonly abused drugs out of circulation. "This initiative addresses a vital public safety and public health issue," according to a sheriff's department statement. "Many Americans are not aware that medicines that languish in home cabinets are highly susceptible to misuse and abuse. Rates of prescription drug abuse in the U.S. are increasing ... as are the number of accidental poisonings and overdoses due to these drugs." The DEA began holding take-backs eight years ago to provide the public with alternatives to flushing expired or unwanted pills down a toilet. According to the agency, since its first take-back event, 9 million pounds -- more than 4,500 tons -- of prescription and non-prescription drugs have been collected at thousands of disposal sites throughout the country. The agency noted that provisions in the federal Secure & Responsible Drug Disposal Act also authorize pharmacies, hospitals and other facilities to serve as collection sites year-round. No questions will be asked of people disposing of pills or other medications, organizers said. More information and a list of additional dropoff locations is posted at: www.takebackday.dea.gov.